If I watch, without intervening, as a crime is committed, am I guilty as well? If I see my neighbour’s house being burgled and don’t call the police, am I in the wrong? If I watch a man beating up his wife and I don’t do something to stop it, should I be ashamed? If I see, as part of my work, clear evidence of either a crime or just something very suspicious, should I do anything about it? Let’s take an example. Let’s say that as part of my work, I discover that a colleague of mine obtained his or her position, or perhaps a promotion, based on a doctorate he obtained from a fake university. Let’s say it’s one of the many online, non-accredited, degrees-for-money establishments like the “Universities” calling themselves Rochville, Headway or Belford. These are all just web sites that “award” you a degree for nothing more than a credit card payment. You do no coursework, sit examinations, attend no lectures or seminars, you don’t, in fact, learn anything. Except perhaps some criminal skills. Because this IS criminal. If someone obtains a financial benefit as a result of a lie then they’re a fraudster. So if you did discover that a colleague had one of these fake qualifications what would you do? Would you keep quiet, assuming it was none of your business? Would you discuss it with the person? Would you go to your boss and explain what you’d discovered? What you call the cops? It’s not my job to be a moral guardian and say what I think you should do in such a situation. However I do think you should do something, not nothing. I think that if you’re aware of a serious crime and you do nothing then you’re ever so slightly complicit in the crime. Let’s think of anther example. Imagine you work in a bank and you spot a strange pattern of payments in a customer’s account. Let’s say that the account had received many deposits, all of exactly the same amount. I don’t mean someone’s salary going in each month, I mean very large numbers of payments all for exactly P2,700, perhaps hundreds of them every month. This couldn’t be a small shop cashing the day’s takings, the amounts were all exactly the same amount. Wouldn’t you be suspicious? Wouldn’t you also be suspicious when you looked at the account and found that it contained millions, literally millions? I think you’d be right to assume that this was an account that was being misused, particularly when you could see that money wasn’t actually ever leaving the account and there were certainly no payments to the tax collectors. Another example. Imagine you work in one of those companies that specialise in sending money around the world. The agencies you might use if you want to send money to your kid studying abroad. Imagine that while working there you saw several people every day sending large amounts of money to far-flung parts of the world. Imagine one person explained that they were sending money to a relative she hadn’t known of until recently but who had approached her on Facebook, got to know her and then suddenly had a financial crisis requiring her help. Imagine another person came in saying he was sending P100,000 to EurExTrade, a known Ponzi scheme. Despite telling him that you couldn’t do transfers that big and taking the time to warn him that it was a scam, he made it clear that he find some other way of sending the money. Several other customers were sending money to join pyramid schemes like TVI Express and Cashflow Pro. Other customers you’ve dealt with made it clear that the money they were sending was a prelude to receiving an inheritance, a massive windfall or a fantastic new job in an exotic country, far, far away. What would your responsibility be? Is it your duty to step in and stop these people sending money to scammers or should you just shut up and take the commission? The sad thing is that none of these examples are hypothetical. Each of them is entirely true, told to me in the last few weeks by the people themselves. The employee who discovered their colleague bought himself a fake degree from the University of Rochville, the bank employee who knows that one of their customers is running a pyramid scheme and making herself incredibly rich and the money transfer company employee who sees victims sending their life savings to a scammer, they’re all real. Of course there are some protections. Banks are obliged to report suspicious transactions to their central bank, in our case the Bank of Botswana who can then investigate and get the necessary authorities involved. Likewise the money transfer agencies. But is this happening? Given the enormous scale of the frauds being committed, the number of people falling for the EurExTrade scam, the number of people still sending money to scammers and pyramid schemes how often do we hear of the authorities stepping in and exercising their powers, in fact their responsibilities, to stop this happening or to prosecute the offenders? Not very often. In fact hardly at all. I honestly don’t know why this is. I’ve met many of the people working in the organisations empowered and entrusted with our protection and they’re bright people. With the exception of NBFIRA and BOTA I don’t recall the last time one of these regulators publicly banned a pyramid scheme I’d ever heard of, or warned the public to stop sending their money to a Ponzi scheme or scammer. We’ve largely been left alone I’m afraid. It’s up to you and me to warn others of the risks they face. It’s up to the media, newspapers like Mmegi in particular, to do it for them. We’ll continue to do it but it’s not the way it’s meant to be. I was looking for a job and I was offered a volunteer position in an orphanage in Costa Rica paying $770 per week by a company called “i-to-i Volunteering”. Can you check them out for me? i-to-I Volunteering is certainly a valid company but that’s not who you’ve been dealing with. In fact the person who emailed you is a scammer pretending to be working with them. The clues were there if you looked very closely. Firstly you’ll see that the scammer is using an email address that ends with "@worker.com". The real company use email addresses ending with either "@i-to-itravel.com" or "@i-to-i.com". You’ll also see that the phone numbers he gives aren’t the same as the genuine company. Instead he’s using a UK-based redirectable cellphone number. You might think you’re calling him in the UK but he could be anywhere in the world. Always be careful calling anyone in the UK who gives a number starting with 7. Like here that’s a cellphone number. Real business people have landlines. Then there’s the great contradiction involved. They're offering you a "volunteer" position but say they'll pay you $770 per week? That's over P300,000 per year. Volunteers don't earn that sort of money anywhere, they’re volunteers and certainly not in a Central American orphanage! I contacted the real i-to-i Volunteering people in the UK and they know about this guy. He calls himself “Michael Lincoln” and is absolutely nothing to do with then. For a bit of fun I phoned him and explained that he’d been exposed and he wasn’t a very happy man. Shame. If he contacts you with a job offer like this, in fact if anyone does, you should either delete the email and forget about it, or alternatively email him back and tell him what you think about him! Don’t feel the need to be polite, he doesn’t deserve it. No, it’s not. I don’t even have to ask you if you have an American Express card to know that this is a scam. The reason is simple. Later in the email it asks you to click on a link to log on to your account. REAL BANKS AND CREDIT CARD COMPANIES NEVER DO THIS. Not ever. No genuine bank will ever ask you to click on a link in an email like this. The most they will ever do is suggest that you log on yourself by opening your browser and typing the address yourself, or using a bookmark you previously saved. The reason is simple. The link in the email doesn’t actually go to American Express, it goes to a “phishing” site somewhere else. You can tell this for yourself by holding your pointer over the link but without clicking. Your browser will show you where the link will actually tell you. The picture shows what happened in your case. If you look closely the link that SAYS it connects to americanexpress.com in fact connects to a page on mrelgin.com. This second site has been hijacked by scammers trying to steal your money. Once you get to the hijacked site you’ll see a perfect replica of the genuine site, so perfect you’ll be tempted to enter your user name and password, handing it over to crooks who’ll be in your real bank account within moments. You can then say Goodbye to your money. Actually the real owners of this site have fixed the problem now but it’s really important that you inspect any links in emails you receive BEFORE you click on them. It only takes a couple of seconds and it might save you from losing the contents of your bank account. Finally, whenever you receive an email like this that SEEMS to be from your bank please forward it to us and also to your bank so they can take action to cut off the scam. I had an online chat with "Affordable Degrees" who sell degrees from Rochville "University". I wanted to know how easily one of my fake identities could get a degree. What about a teacher's aide who wanted to become a fully qualified teacher without all the bother of studying for a genuine qualification? Rochville is a fake, in case you didn't already know. They claim on their web site that they are accredited by both the "Board of Online Universities Accreditation (BOUA)" and the "Universal Council for Online Education Accreditation (UCOEA)" but neither of these bodies are actually recognized accreditation bodies. This is the conversation I had. It says all you need to know. Gary Smith: How may I help you? Me: can you tell me how quickly i can get a degree from rochville university? Gary Smith: which degree are you looking to obtain? Gary Smith: would that be for Bachelor's or Master? Me: i thought a bachelors but can i get a masters? Gary Smith: how many years of work experience you have? Me: but i can get it in 12 days? Me: how much will it cost? Me: must i sit exams to get the degree? Gary Smith: What we do is we take down your life experience, that is your working experience and your past educational qualification, convert them into credit hours, if these credit hours are equivalent to the credit hours that are require to complete your desired degree then you qualify and we award the degrees accordingly, if you are successfully evaluated we start with the registration process registering you and your documents with the university and the Accreditation bodies and after that we make sure that the documents are shipped out to you in the next 10 working days. 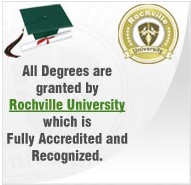 Does anyone need any further evidence that Rochville "University" and their brother in crime "Affordable Degrees" are selling fake degrees? EurExTrade. Get out now. If you can. I’m really, really worried. For once I think it might be too late to prevent a series of minor disasters. I’m not talking about the inability of certain monopolistic utility companies to get their billing systems working (I haven’t had a power bill since January) [see correction below], nor am I talking about the 800 loan sharks who’ve gone underground since NBFIRA got tough with them. I’m not talking about the traditional “healers” with their fake concoctions that injure and kills our neighbours, friends and relatives. This time it’s a rip-off financial scam that is getting out of control. I’m not exaggerating, about a quarter of the emails we get at the moment are about the same thing: a scheme called EurExTrade. The first time I heard of EurExTrade was about a year ago when we were asked by a reader if they should “invest” with them. He’d heard that people were making lots of money from the scheme and was now tempted himself. My reaction then was that it seemed too good to be true and I wouldn’t risk any of my own money in such a thing. Over the year since then, we’ve have more and more people get in touch asking for advice. My advice is simple. EurExTrade is a scam. It’s a Ponzi scheme. You are giving your money away if you “invest” with them and you won’t get it back. The clues are quite clear if you look for them and if you look past the frankly amazing claims they make. On their web site (which used to be eurextrade.com but is now eccpub.com) they clearly that you can earn “up to 2.9% daily”. This is simply impossible. Earning 2.9% per day and reinvesting the earned interest comes to an annual percentage rate of over 3,000,000%. There is no legitimate investment scheme that consistently makes that sort of profit. There isn’t, there never has been and there never will be. If there was such a scheme don’t you think the banks, the bankrupt Greek Government and investment companies around the world would be doing it as well? It really is too much to ask that the owners of a web site have accumulated more financial wisdom than all the financial experts in the world. You have to ask yourself this: How do EurExTrade say they can possibly make this sort of money? Again we only have their web site to rely on. They explain their business using phrases like “short term, technical analysis based positions” and “longer term, global events driven long term profitable projections” and “in house developed trading algorithms” but that’s all claptrap, just a sequence of clever-sounding words. In fact all they are doing is taking the “investment” from you to pay something to the person who joined last week. Of course they’re keeping the majority of it themselves. That’s how a Ponzi scheme works. It’s a scam. Most importantly all Ponzi scmas eventually collapse. Sooner or later they run out of gullible new victims and the cash flow stops. When the investors want either earnings or their money back there’s nothing left and people end up either in poverty or prison. One of the readers who got in touch reported that many senior citizens in her home village had each been persuaded to send P3,000 to invest in EurExTrade using Western Union not to Panama, where they claim to operate, but to a recipient in Novosibirsk in Russia. That’s way too suspicious to be credible. Ironically there’s even a slight pyramid scheme element to the them as well. They announce on their web site that their “affiliate program pays up to 10% on deposits of referred members.” So you get paid for recruiting other victims, presumably your friends, colleagues, neighbors and relatives? That’s not a good way to make yourself popular, is it? This is all fairly straightforward. It’s a fairly traditional Ponzi scheme, nothing inherently surprising. Until you dig just a little bit deeper. On their web site they give a long list of contacts, people you can reach if you fancy being recruited and giving them all your money. The list shows 53 contacts, 1 each in Panama and Dominica and others in a variety of countries. There’s just one contact for all of South America, likewise one each for India, the USA and the UK. However the thing that interests me most is the number of contacts in Africa. There are three for South Africa and eight contacts in Nigeria alone. Get this. 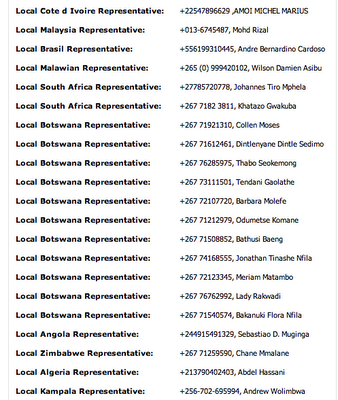 There are ELEVEN contacts for Botswana. 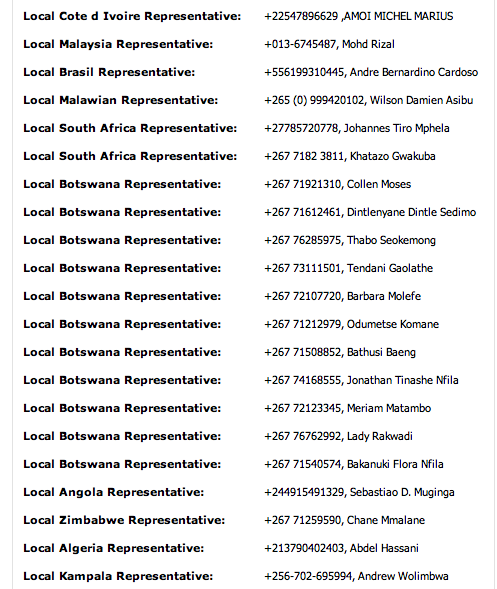 Even the contacts for Zimbabwe, Namibia, Lesotho and Tanzania have Botswana cellphone numbers. Two of the contacts in South Africa have Botswana numbers. In total 40% of all the worldwide contacts for EurExTrade are in Botswana. What’s going on? Is this actually a scheme being run from Botswana or are we being targeted specifically? If so, why? Are we naturally gullible? Are we seen as a country most likely to fall for scams? That’s the worst possible explanation, that we are seen as a country of gullible fools. We need to change that perception before more of our neighbours, family and friends fall for things and lose everything. The advice is simple. Whatever you do, avoid any scheme that looks like EuExTrade, sounds like EuExTrade or is called EuExTrade. Anyone who tells you that you can make nearly 3% interest per day is either a fool, a liar or perhaps even both. Either way they can’t be trusted, certainly not with your money. If you’re already in the scheme do your very best to get your money out now, today, before it’s too late. On the 3rd of August I paid rent to a house that I was supposed to occupy on the 5th of August but I failed to because I was offered accommodation elsewhere. I went back them on the 9th of August to claim my money which was P550 and they told me they could not refund me because I delayed them from finding someone else to occupy the house. They told me they will give me P300 instead of P550 because of the delay of which they have not given me to this date. There was no written contract. My question is, is it fair for them to give me P300 instead of P550? Please help me. Unfortunately I’m not sure you’re being entirely reasonable. It wasn’t the landlord’s fault that you changed your mind, in fact the landlord has probably been inconvenienced by it. As they said they’ve been delayed in finding a tenant who’ll actually move in and start paying them the rent. Even though you didn’t sign any form of agreement with them they are probably entitled to withhold some of the money you paid them. I suspect that most people would think they’re being reasonable in giving you back most of the money you paid them. The other problem is that you would find it very difficult to force them to pay you back the entire amount you paid them. I’m not even sure how you could do that. Finally, what were you thinking paying them the money without any written agreement? That really was unwise. Whenever you rent a property, whether it’s to live or for work you MUST have a written agreement that has been signed by both parties. Without that you have very little protection against abuse. It is in order to applaud you for the wonderful work you do at The Voice. Firstly, I would like to bring to your attention something I have noticed with one store at the station in Gaborone. I have a big appetite for chicken gizzards and have noticed how they are always in stock and recently realized that they change Best Before dates on the gizzards and extend the days of the product. This poses a risk to the lives of customers buying these products and I have since taken to close scrutiny of the gizzards when I buy them from that store. Secondly, I would like to raise a concern with taxi drivers in Gaborone who are in the habit of not refunding people their 10 thebe as part of change for the P3.90 charge for a taxi. It has also grown to be a common habit for taxi drivers to refuse to provide change to passengers by simply saying they don't have change as service providers. Once again thank you for your column and appreciate your work. Firstly, many thanks for your very kind words. The team at The Voice and also at Consumer Watchdog always love to hear positive feedback so thanks again. You are, of course, very wise to keep an eye on the Best Before dates on food, particularly meat products. It’s almost impossible to get reliable figures on the number of deaths from food-poisoning in Africa each year but you can rest assured that it’s at epidemic levels. It’s therefore extremely reckless for stores to adjust the Best Before dates on food they plan to sell us. I suggest that you speak to the store manager and ask him or her to confirm their rules about this sort of thing. You might also want to ask them whether they’ve got a copy of the Labelling of Prepackaged Foods Regulations? If not, tell them I’m happy to send them a copy free of charge! Your second question about taxi operators not offering change and making up excuses about not having the right coins is a good one. Of course they must give you your change, it’s not theirs to keep. I can imagine it happening occasionally but surely it should be a rare thing? How difficult can it be for the taxi owner to go to the bank and get a bag of 10t coins every time he pays in all his cash? Assuming of course that they have a bank account and aren’t operating an unregistered business? I wonder if they pay taxes like the rest of us? The "Doctor" will see you shortly. For P5,500. 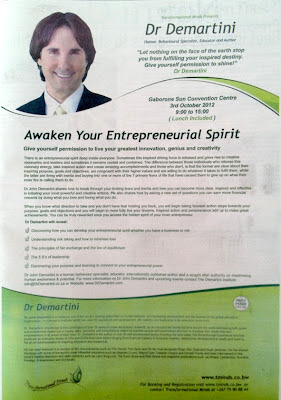 The papers all have advertisements for a forthcoming seminar by Dr John Demartini, who they claim is a "Human Behavioural Specialist, Educator and Author". 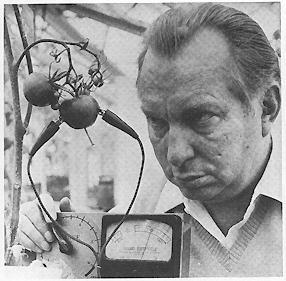 His achievements include being "featured in various national and international film documentaries and movies including The Secret, The Opus, The Compass, The Riches and Oh My God". The Secret? That nonsensical, morally dubious claptrap? 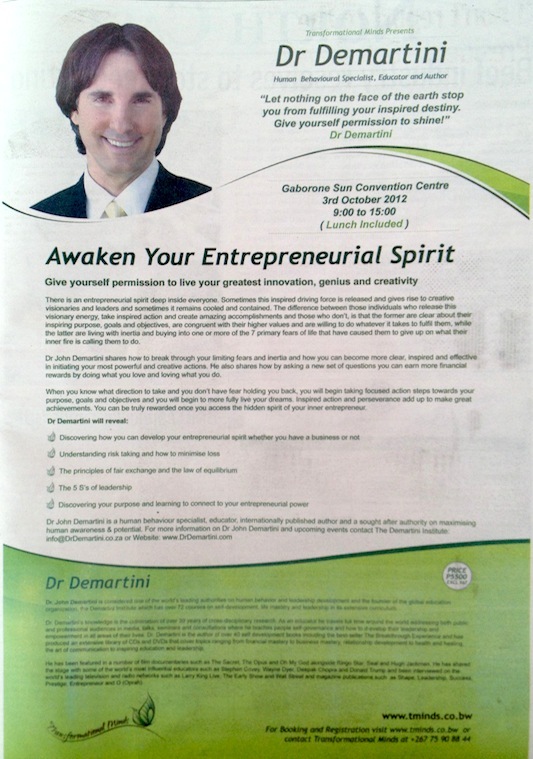 The advert claims that he can "awaken your entrepreneurial spirit" etc etc etc blah blah blah. You might be wondering how he is a "Doctor"? His first degree was in Biology but that's certainly where the science ends. His Facebook profile says that "He went on to study Chiropractic at the Texas Chiropractic College where he graduated with honors and his Doctorate in 1982". Chiropractic is pseudoscience. It's bogus. At best it doesn't work, at worst it harms people. And this qualifies him to teach us how to improve our lives? Why should we take advice (for P5,500) from a Doctor of Pseudoscience? Unfortunately he's another of the many "educators" who break one of my cardinal rules. Please don't mention quantum physics unless you really know what you are talking about. If you know anything about physics see how long you can get through this video of Demartini discussing quantum physics without laughing, choking or swearing. "Dr. Demartini’s trademarked Demartini Method®, which is the result of 39 years of cross-disciplinary research and study into human behavior, works with perceptions and assists people to gain a more balanced perspective and enables them to dissolve their emotional charges, challenges or issues within a matter of hours." "Dr. Demartini has donated his time to work with prisoners, wardens and police service personnel around the world. His focus with wardens and police has been to assist them in managing the stress and the emotions of their positions, understand human behavior and driving motives, stay inspired by what they do and grow their self worth." "Dr. Demartini immersed himself in books covering subjects from cosmology, astronomy, astrophysics, physics, metaphysics, theology, mythology, philosophy, anthropology, economics, sociology, psychology until eventually his insatiable interest took him through the studies of over 280 different academic disciplines." "At the age of 18 he read a book by the philosopher Wilheim Leibniz titled ‘Discourse on Metaphysics’ [which] inspired Dr. Demartini to set out on a quest to find a way of helping himself and others discover and experience this underlying divine or implicate order that Leibniz spoke of. Today, we now know that Dr. Demartini did master a way which is called the Demartini Method." Let me think. Who does this nauseating hero-worship remind me of? Of course you're welcome to drop P5,500 per person to attend this one day workshop if you wish. It's your money. Or perhaps your company's. Just don't expect miracles. Just expect to be P5,500 poorer. A scammer calling himself "Michael Lincoln" claims to be working for i-to-i Volunteering, a UK-based company that coordinates volunteering and English-teaching around the world. However he is nothing to do with them at all. I know this because they told me so. However I was certain of this before I spoke with them. Firstly he uses an email address nothing like theirs. They use either "@i-to-itravel.com" or "@i-to-i.com" but he uses "i-to-i@worker.com". The phone numbers he gives in his offer letter are also completely different to the genuine ones. The number he insists you call him on is one of those re-directable UK cellphone numbers. Who knows where in the world he might be. Then there's the offer he makes. $770 per week for a volunteer? That's $40,000 per year, over P300,000. For someone volunteering in an orphanage in Central America? I think not. It's simple. Job offers out of the blue from total strangers offering vast salaries are scams. So where is the scam you might ask? Attached to the email is the invoice for £400 for his services which he demands you pay before anything else happens. It's what you might call an "advance fee". Sorry "Michael", you've been exposed. Have a nice day. The law is a magnificent thing. A decent legal framework is the foundation of a civilisation. It sets the rules we should abide by and, just as importantly, defines the freedoms we don’t have. Not the freedoms we have, the ones we don’t have. Something people often overlook is that a civilised society is permissive, not prohibitive. All things are permitted until they are prohibited. Until a law is passed saying that the wearing of a purple t-shirt is prohibited, wearing purple t-shirts is permitted. Until something is made illegal you’re allowed to do it. We’re lucky in Botswana to have a fairly decent legal system. Obviously it’s not perfect but it’s a whole lot better than many others. Mistakes are still made but very often they’re later overturned. When a hard-working, hugely respected, committed and highly talented cardiologist is persecuted by an establishment doing their best to put him out of business the Appeals Court will step in and belatedly put things right, allowing him to continue saving lives. Purely hypothetically of course. When our Government makes a mistake it’s possible to take them to court and have their decisions overturned. That’s the sign of a democracy. Consumers should also be grateful for our laws. They should also be grateful for some of the rulings that judges occasionally make. My favourite relates to the “in duplum” rule. “the in duplum rule serves to aid debtors in financial difficulties by holding that it is unlawful to recover interest equal to or more than the capital sum upon which interest had accrued” [and that] “the in duplum rule cannot be waived and circumvention of the rule cannot be tolerated by courts”. In simple terms a loan shark cannot enforce, as we heard some months ago, a debt of over P13,000 for an initial loan of a mere P2,500. If this claim ever reaches a court the judge will laugh in the loan shark’s face. Unfortunately many micro-lenders are relying on borrowers’ understandable fear of going to court. Nobody wants to end up in front of a magistrate or judge but the irony is that that’s where the law is best applied. Outside of court a shark can demand whatever he wants. As soon as the law can be exercised things become more respectable and civilised. It’s important to understand that the “in duplum” rule isn’t there to protect unscrupulous borrowers, it’s there just to place a limit on how sleazy lenders can be and to prevent the really sleazy ones from going too far. In Mmegi last Friday it was reported that “Over 800 micro lenders go underground”. According to the CEO of NBFIRA, only 151 lenders have come forward to register with NBFIRA since being required to do so. The vast majority have, for whatever reason, decided not to obey the law. It’s possible that some have decided to go into a more legitimate line of business, some perhaps have stayed in the same line of business and are operating illegally, others are no doubt selling drugs, pimping prostitutes or trafficking slaves. I’m not joking. The biggest mystery for me about the micro-lending industry is where some of them get their money. All lenders need to start with capital. They need a large amount of ready cash to start their business, to make those first loans. They also need a large operating balance to lend the often significant amounts they offer but where does all that cash come from? I don’t think it’s hard to guess where some of them get that money: from the proceeds of crime. It’s hard to think of a better way to launder money than by setting up an unregistered micro-lending company. The amounts of cash flowing through the company would be significant and very hard to trace. Who knows who the real borrowers are, whether they really exist or whether their real name is M. Afia. Luckily NBFIRA seems to be a fairly formidable organisation. The people I’ve met who work there all seem to be committed to making real changes to the industries they regulate. I can’t imagine them just ignoring the missing 800 loan sharks. Sooner or later an angry customer who has been abused by an unregistered loan shark will complain and NBFIRA will take action against them. It’s not just the shady parts of the business world that the law can affect. Recently one of my favourite organisations came under the gaze of the Appeals Court. The case was actually rather dull to the people not involved. It related to the liquidation of a company and the rights various creditors had to claim money from remnants of the company and the new owners of the company’s assets. All a bit boring. Except for one thing. One of the parties involved was our dear friend Botswana Power Corporation. Were they entitled, the Appeals Court was asked, to refuse to supply power to the new owners while there was an outstanding debt owed by the previous customer, the liquidated company? Many of us have experienced this. BPC refuses to supply you with power until the debt owed by the previous owner or tenant of the property is repaid, often demanding that YOU repay it, someone else’s debt. So there, BPC. Stop it now. The Appeals Court has spoken. The LAW says you can’t do that any more, OK? This is another occasion when we should celebrate our legal framework. Every so often it produces a ruling that is sensible, logical, reasonable, relevant to ordinary people and, above all, just. Please check if eccpub.com foreign exchange traders are genuine. A friend of mine wants to invest money with them because some people had “for several years made big profits” by investing with them. From what he tells me, one deposits at least P10,000 so they can trade in forex for the client. After some period (six months or so) of trade they remit the client the profit realized. I suspect they are not genuine as they are not registered in Botswana as a bank or bureau de change. Moreover, they might be an international scam syndicate. The web site you mention is just the new web site of EurexTrade, the company I’ve mentioned many times before. This is almost certainly a Ponzi scheme, where the “investments” people make to trade in foreign exchange are actually used to pay the earlier generation of people who “invested”. In fact it’s unlikely that ANY of the money they take is invested in foreign exchange at all. The evidence for this is simple. They claim on their web site that you can make “up to 2.9% daily” profit with them. That’s simply impossible. Nearly 3% every day? No investment scheme in the history of the world has delivered that sort of return over any significant period, certainly not by trading foreign exchange. If this really did work don’t you think that banks, genuine investment companies and the Government of Greece would be doing so? There are more and more signs that this company is going to fail soon, as all Ponzi schemes eventually do, when they run out of potential victims so I beg you not to join and to help prevent everyone you know from joining. If you’re in already do your very best to get out now before you lose everything! [Part 1] Recently, I heard grannys were send over P3,000 to Russia thru Western Union. After some time they will keep on getting interest, not that any of them has actually got it, though some are saying someone got the interest. And also they believe they are banking their monies out of the country. My first instinct was this is a scam or a pyramid scheme. If you could help because most oldies in the village are affected. [Part 2] I didn’t have all facts, but now I do. Its a company claiming 2 be investing peoples money and its making rounds around the elite in Gaborone. Their website, www.eccpub.com promises high profits for money invested. I checked their website, to an ordinary person it looks real, but when you check the contacts, there are Batswana, some are Batswana we know, and we know where they work. The company is based in Panama so I don’t get why money has to be sent to Russia. The only reason I’m doing this is to warn Batswana that there is no sweet without sweat! You have to work hard to get returns. People have invested a lot in this bogus scheme and are still waiting to get their interest plus there is a likelihood they won’t get the original money they invested. They should ignore the emails of these get rich quick schemes. You deserve credit for your community spirit and also for your detective skills! Yes, it’s another report about EurexTrade who now operate from the eccpub.com web site. I also am mystified why they would want money wired to them in Russia, it’s yet another reason to view them as VERY suspicious. I also took a look at their web site and it’s very interesting. 53 different contacts are given and 12 of them are for Botswana alone. What’s more, the contacts for South Africa, Tanzania, Zambia, Lesotho, Namibia and Zimbabwe all have Botswana cellphone numbers. 21 of the 53 contacts appear to be here in Botswana yet only one contact covers all of the USA, UK and India. Why so many here? Is it because we’re more gullible than the rest of the world? Is it because we’re greedier? Is it because this particular scheme is focused specifically on us? Or is it even perhaps because we’re behind it? Whatever the reason, I think this indicates that as you say, many of our friends, family and neighbors and throwing away their money in a scheme that we all know will collapse sooner or later. Hopefully enough people will realize before it’s too late. What can BPC charge? The law has intervened. Many of us will have had the experience of moving to a new house or office only for BPC to tell us that the previous owner or tenant owes them money. As a result they refuse to connect you until the outstanding debt has been settled. We all knew instinctively that this was wrong morally, it now seems that it's wrong legally as well. "successive owners are not responsible for payment of the bills of earlier owners, nor for the bills of their tenant consumers, and nor are owners or subsequent tenants responsible for the unpaid bills of earlier tenants, as is a common misconception." "there is no right of action enabling the Corporation to claim payment of somebody else's debt from a new owner. Where the premises change hands, the Corporation remains with its right of action against the consumer who incurred the debt." "can minimize its risk by timeous meter reading, prompt billing, and expeditious cancellation or disconnection for non-payment when it is still covered by its two months deposit." Ironic, isn't it, that the Court of Appeal seems to know more about how to run an electricity supply organisation than BPC does. Can you blame a child for its parent’s crimes? Certain faith traditions say you can, common sense on the other hand says this is cruel, nasty and offensive. Just because someone’s Mum or Dad was no good, we don’t punish the kid for that. What about in business? Can we blame one part of an organisation for crimes committed by another part? Can we blame a local branch for bad things done by Headquarters? Can we blame the organisation in one country for the misconduct of its parent company in another country? Can we, for instance, hold Barclays Bank in Botswana responsible for bad things their parent company did in London? As you may recall Barclays in the UK was caught manipulating the “Libor” rate, the interest rate that banks use when they lend each other money. Internal emails emerged clearly proving that the guilty employees had done this knowingly, that many senior staff knew about it and that everyone concerned knew that what they were doing was wrong. The scandal was uncovered by the press and the UK banking regulators went in, investigated and fined Barclays a massive £290 million. Barclays’ CEO in London, Bob Diamond, was forced to resign and Barclays’ reputation took a major knocking. So are we entitled to hold our part of Barclays responsible for the crimes of the British part? Would we be morally entitled to close our accounts or at least not to open new ones with the bank as a result? Would we be entitled to think less of them here? Let’s think of another example. The UK division of a G4S, the global security services company we all know, is thought by many to have been massively incompetent during it’s preparation for the recent Olympic Games. Rather than offering the 10,400 trained security guards that they had promised the organisers to protect the Games, they eventually could offer no more than 8,000, forcing the British Government to mobilize their already hard-stretched Army to step in and cover the gap left by G4S. The British people, and every one else who visited the Games, was shocked at the uselessness of the security company, particularly when the Chief Executive of the company was dragged, kicking and screaming (metaphorically) to give evidence before the British Parliament and to explain his company’s failure. Luckily the Olympics Games were a remarkable success but that was no thanks to G4S getting things so badly wrong. But this was all in the UK, surely? What does it have to do with us in Botswana? Anything at all? But what about their reputation? Are we entitled to judge either company differently in Botswana based on their conduct elsewhere? I think it depends. If a problem happens in a far-flung country that has no connection to Botswana I think it would be unreasonable to judge them here. But the thing that links both Barclays and G4S in Botswana is that they both report to London, directly or indirectly. London is in charge. I’m not suggesting that in either case there’s any link between the conduct of London and their behaviour in Botswana. Of course there isn’t. However I think we ARE entitled to ask questions about the culture and ethos set by Head Office that might affect our local operations. If it’s safe to assume that both the Libor rate fixing and the Olympics security fiasco were just aberrations, that they were caused by “rogue traders” who were acting in defiance or ignorance of managerial control then it’s OK. However, if these problems were caused, or just permitted, by something rotten in the culture of the organisations then I think we’re entitled to draw our own conclusions. I think it’s also perfectly reasonable to choose a company based on personal preference. If you just don’t like a particular company you’re free to exercise that preference. I have a fondness for Apple, Virgin Atlantic and Swatch and will choose their products over those of the competition, all things being equal. There are also companies who I just don’t like, either because they continued to operate in South Africa during the apartheid years, because they have a history of bigotry or have made dubious business decisions. I’m free to avoid those companies if I want, just as you’re free to exercise your preferences as well, whether they’re positive or negative. That’s one of the reasons companies have to manage problems really, really well. Barclays and G4S should really be undertaking a major public relations exercise, trying to address the negative perception people around the world now have regarding them. They need to be doing their best to persuade us all that they’ve seen the error of their corporate ways, are now reformed characters and can be trusted in future. Then we can all make a decision based on the perception they create. But are they doing this? I haven’t seen it yet. I bought a hair piece (Sangita colour 2) at a store in the station mall and then went to the nearest salon in the same mall. After a few minutes I realised it’s not the right colour 2 even though it was written colour 2 on the package. Immediately I went back to the store and asked for an exchange so I can choose the colour I wanted. I was told (rudely by the man at the cash point) that I should have never came back because once you take something bought in that shop out it can never be returned regardless of whatever happens and they don’t issue receipts to the customers. Whenever you enquire or show disapproval of something they will tell you to go to the next shop and don’t bother coming to their shop. Clearly the owner or manager of this store shouldn’t really be in the retail business. Or any business at all. The store has breached a number of the Consumer Protection Regulations and I think you should write them a letter explaining this. You can begin by pointing out that they failed “to meet minimum standards” by selling you a hairpiece that “does not match any sample or description given to the consumer”. It said on the packet that it was one colour but in fact was not. That’s a breach of Section 13 (1) (a). They also breached Section 13 (1) (d) by falsely claiming that the item was “of a particular style or model”. In your letter you should state that you’re cancelling your deal with them and politely request that they give you a full refund for the amount you paid within 7 days. Remind them that Section 15 (1) (e) of the Consumer Protection Regulations requires a supplier to “promptly restore to the consumer” a refund when a deal is legitimately cancelled. Make it clear to them that the letter is also being sent to the Consumer Protection Unit in the Ministry of Trade and Industry and also to us and The Voice. Let me know how they respond to the letter? I also most forgot. Make sure you tell everyone you know about the store and how unpleasant the management are. Suggest to your friends, relative and neighbors that they think twice about shopping there! 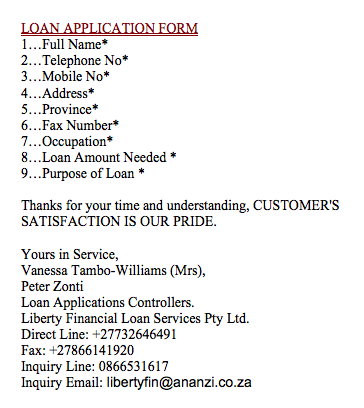 I received an email from Liberty Financial Loan Services who offered me a loan of R10,000 to R10 million. They say that they offer loans at only 3% interest. Can this be true? No, of course it can’t be true. This is a scam. To begin with there is no legitimate lender who approaches total strangers offering them loans like this. Secondly no legitimate lender, in fact no legitimate financial enterprise these days, uses a free Gmail address as their primary email address. Real companies also have offices with landlines, not just the South African cellphone numbers these crooks quote. Most importantly, this company, “Liberty Financial Loan Solutions”, which claims to operate from South Africa, doesn’t actually exist. No such company is registered in South Africa. Above all, no lender in the world offers loans at an interest rate of 3%. This is just the beginning of an advance fee scam. Despite what their initial email says sooner or later there WILL be some form of payment they’ll insist you make. That’s what the scam is all about, that “advance fee” that you pay them. if you do fall for it and pay them they’ll just string you along with more and more demands for more money. This won’t stop until you either wise up or run out of money. I suggest that you either delete the email or send them a reply using as many rude words as you know! I think it’s fair to say that you shouldn’t trust anyone who approaches you out of the blue and offers you something, particularly when they use a free email address. If they can’t string a sentence together in conventional business-quality English you should always be suspicious. Certainly, when what they offer you sounds too good to be true, you should know that it IS too good to be true. The solution is never to believe ANYTHING you read in an email from a stranger unless you have a very good reason to. Be skeptical. 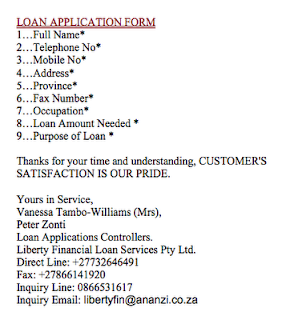 Another scam - "Liberty Financial Loan Services"
"I received an email from Liberty Financial Loan Services who offered me a loan of R10,000 to R10 million. They say that they offer loans at only 3% interest. Can this be true?"